Born in Winnipeg in 1920, his family later moved from New Iceland Manitoba to the Dafoe and Wynyard area. Educated in Dafoe and Wynyard Saskatchewan. And known locally as a talented musician writing and arranging his music with his own orchestra. He worked as a mechanic in Wynyard before joining the RCAF. He enlisted in Saskatoon in 1941. His brother Elmo was with the USAAF from 1942 to 1946. After completion of his training in Canada, he was posted overseas. His arrival at 419 Squadron was sometime in late September 1942. Before flying with his own crew he would have to complete operations with an experienced crew. On October 2nd 1942 while on his very first operation and serving as 2nd. 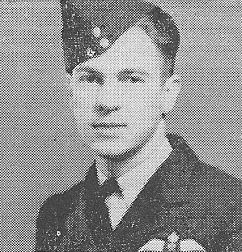 Pilot Helgi was killed along with four others of the crew of WO Sidney Stowe on Wellington BK269.